At the news conference today, Holder described his discussions with his Mexican counterpart about the recent spike in violence. "I met yesterday with Attorney General Medina Mora of Mexico, and we discussed the unprecedented levels of violence his country is facing because of their enforcement efforts," he said. Holder declined to offer any time frame for the reimplementation of the assault weapons ban, however. "It's something, as I said, that the president talked about during the campaign," he said. "There are obviously a number of things that are -- that have been taking up a substantial amount of his time, and so, I'm not sure exactly what the sequencing will be." In a brief interview with ABC News, Wayne LaPierre, president of the National Rifle Association, said, "I think there are a lot of Democrats on Capitol Hill cringing at Eric Holder's comments right now." U.S. Guns Arming Mexican Drug Gangs; Second Amendment to Blame? 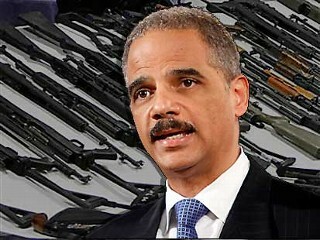 "I think closing the gun show loophole, the banning of cop-killer bullets and I also think that making the assault weapons ban permanent, would be something that would be permitted under Heller," Holder said, referring to the Supreme Court ruling in Washington, D.C. v. Heller, which asserted the Second Amendment as an individual's right to own a weapon. "A semi-automatic is a quintessential self-defense firearm owned by American citizens in this country," LaPierre said. "I think it is clearly covered under Heller and it's clearly, I think, protected by the Constitution."